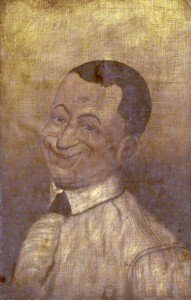 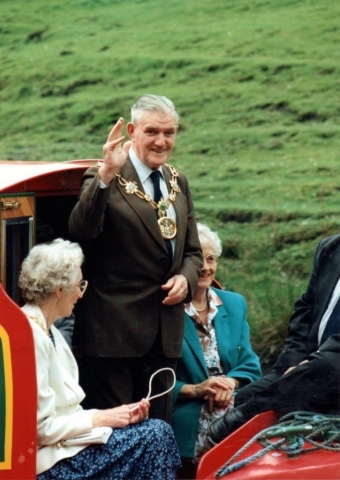 Gordon Batty Collection – Parish Church of St. Chad, Rochdale. 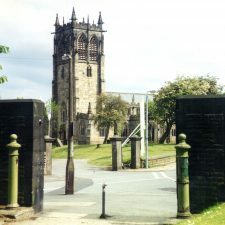 There is a tradition that the Parish Church of Rochdale was intended to have been erected down by the river, but that when the foundations were being laid, overnight they mysteriously disappeared, to re-appear at the top of the hill near the present site of the church. 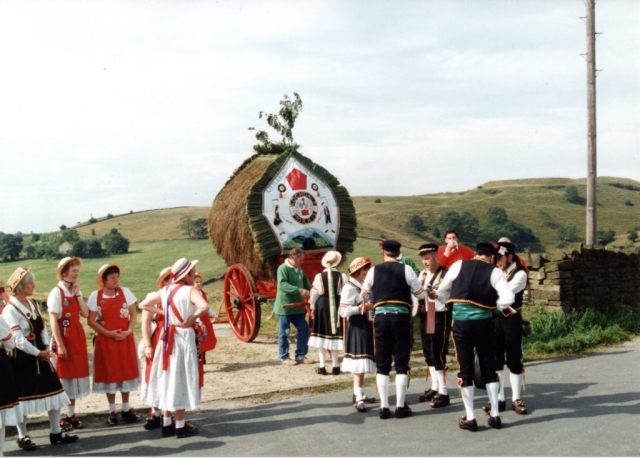 Several attempts were made to build in the valley, but each time the same thing occurred, and the materials would mysteriously be moved over-night, so eventually it was agreed to build the church on its present site, and no further trouble was experienced. This in not an unfamiliar tale and St. Chad’s is not the only church to which it has been ascribed. 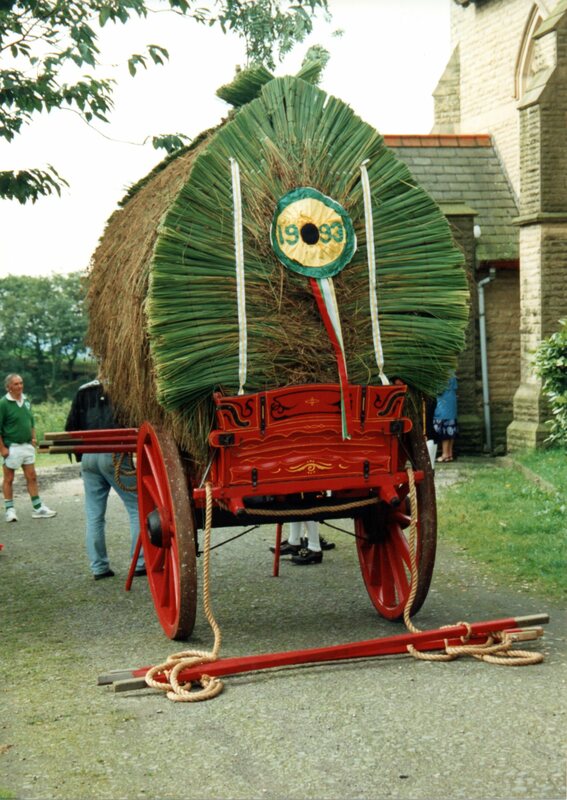 Stalwart fine fellows were they, clothed in well-fitting tunics of the fashion of the day, and of a colour so like that of grass that one could readily understand how easily the owners might lie in ambush in some parts of the country—in forest lands, for instance—were they so disposed. 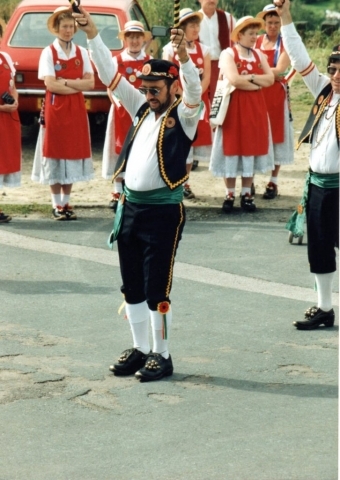 There were at least a hundred men, and every man was armed, most of them with that splendid English weapon, the long-bow, which in later days gained Crecy and Poictiers and Agincourt, and the use of which Bishop Latimer (in 1549) described as “a godly art, a wholesome kind of exercise, and much commended in physic.” Many of them, however, carried quarter-staves—tough poles of wood some seven feet long, shod at each end with iron, and which, when grasped in the hands of athletic men and twirled with practised skill, became terrible weapons, one blow from which usually terminated a combat. 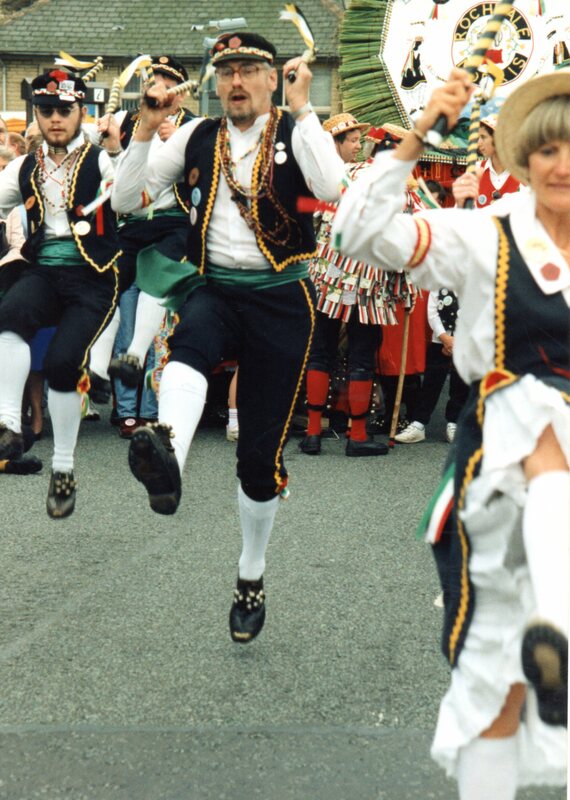 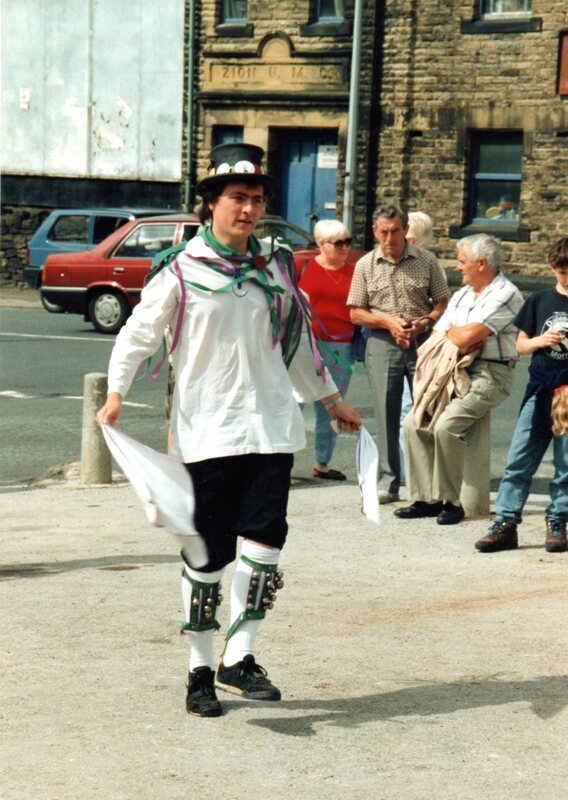 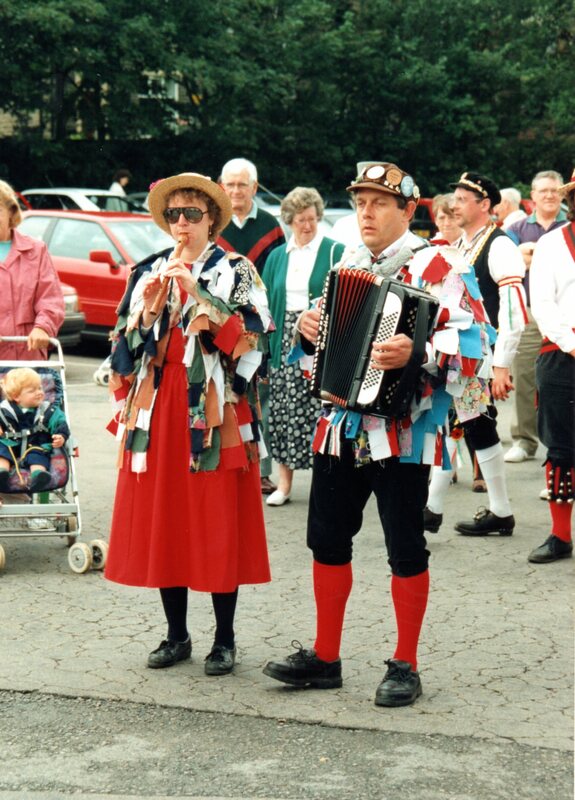 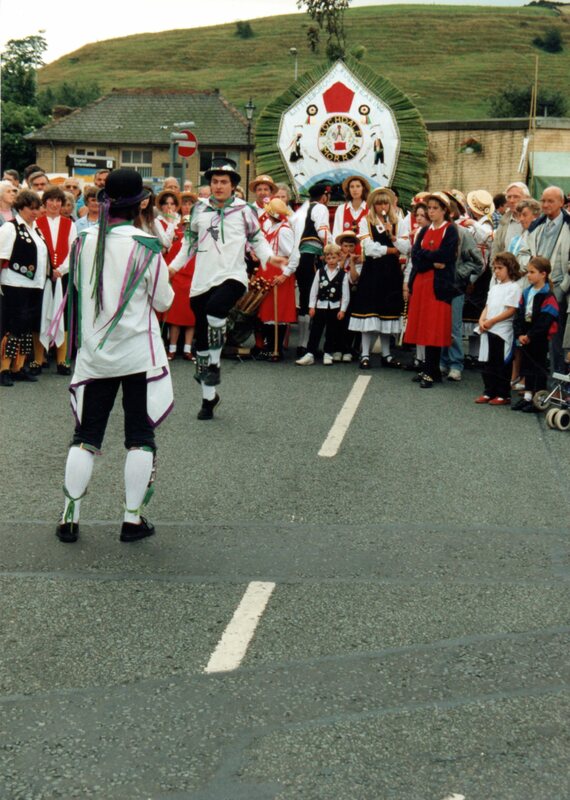 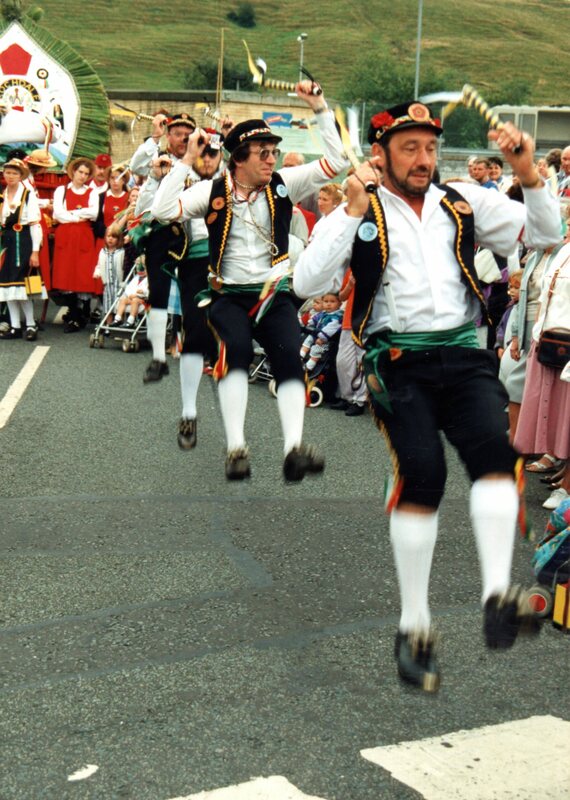 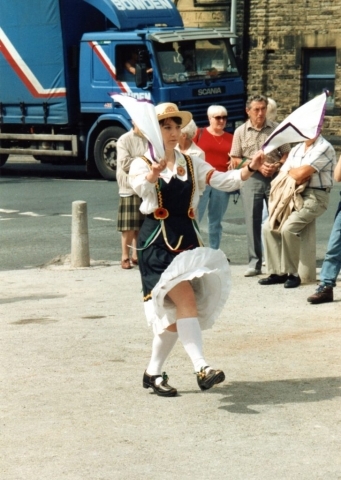 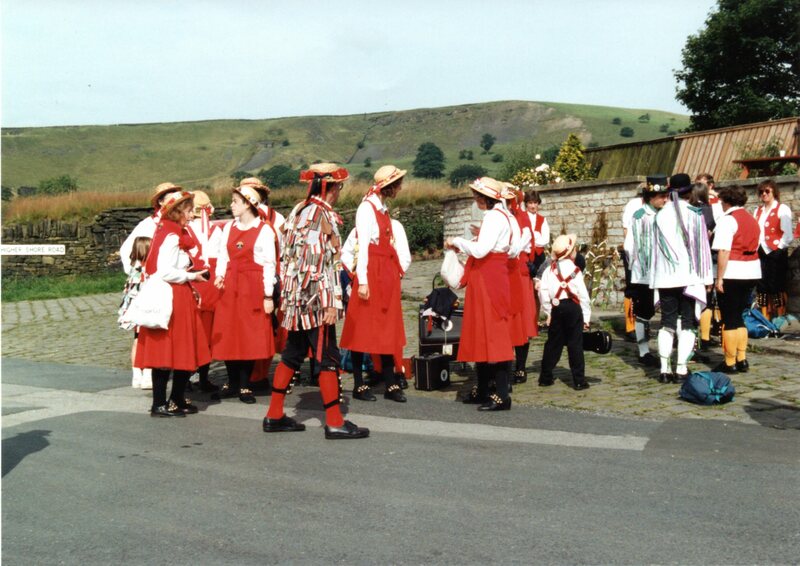 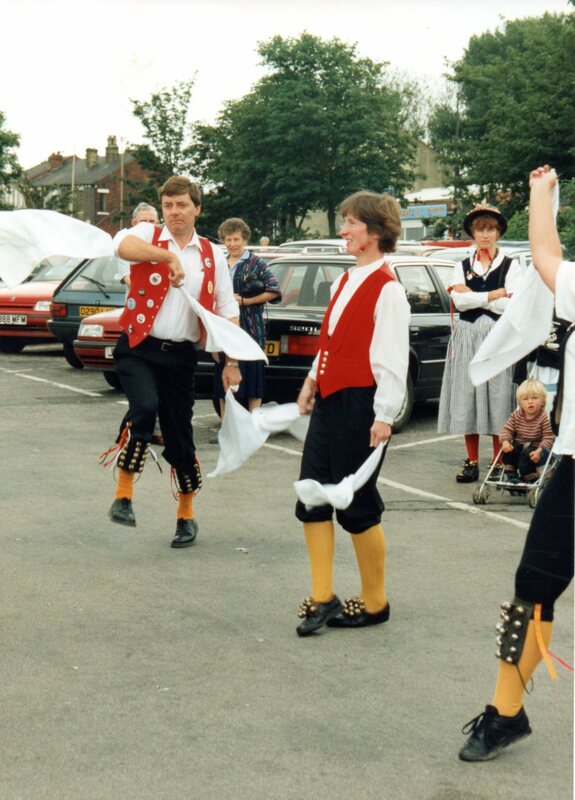 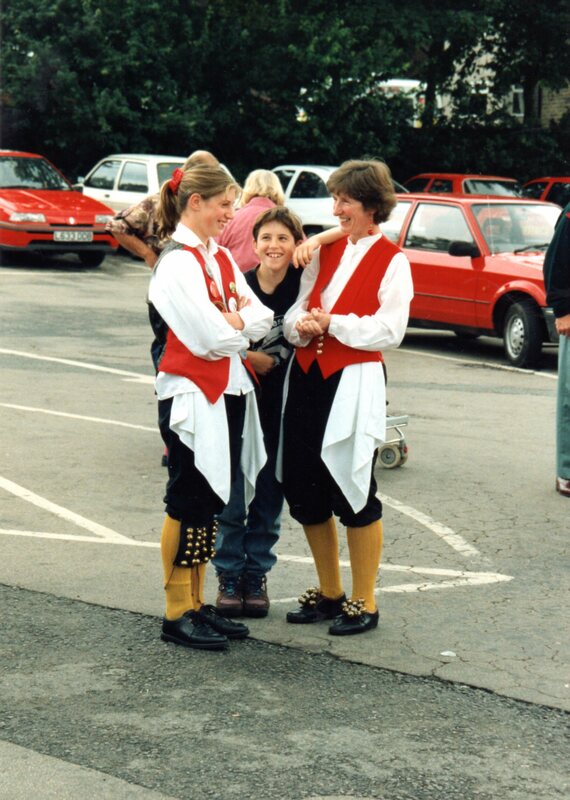 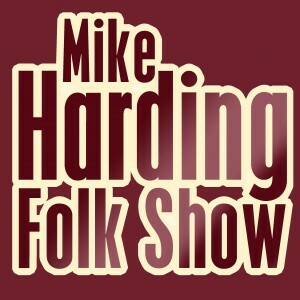 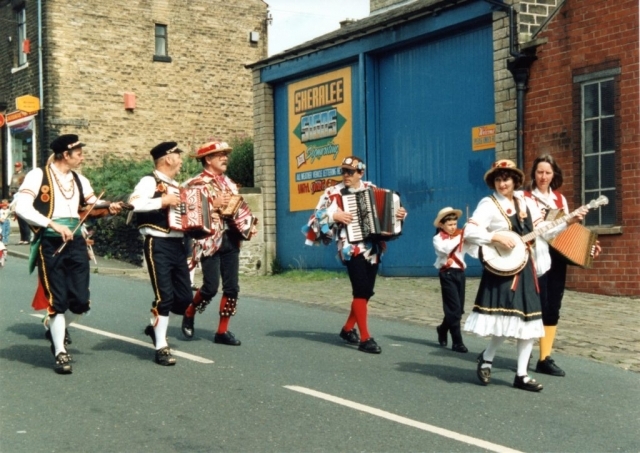 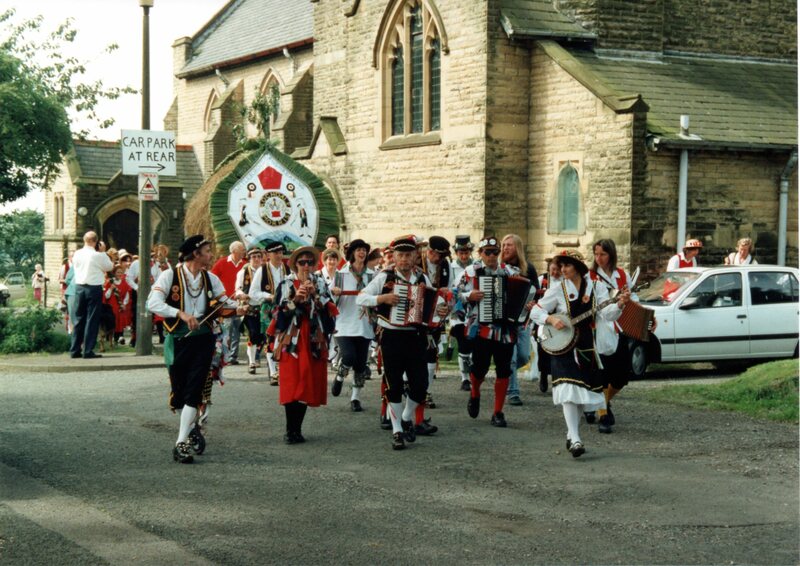 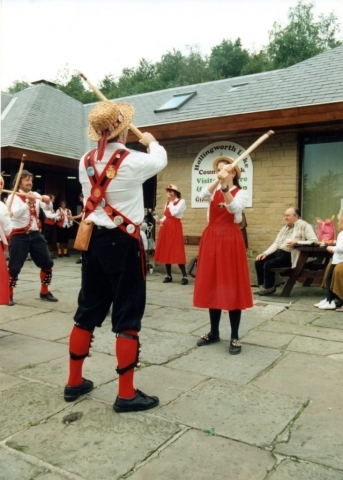 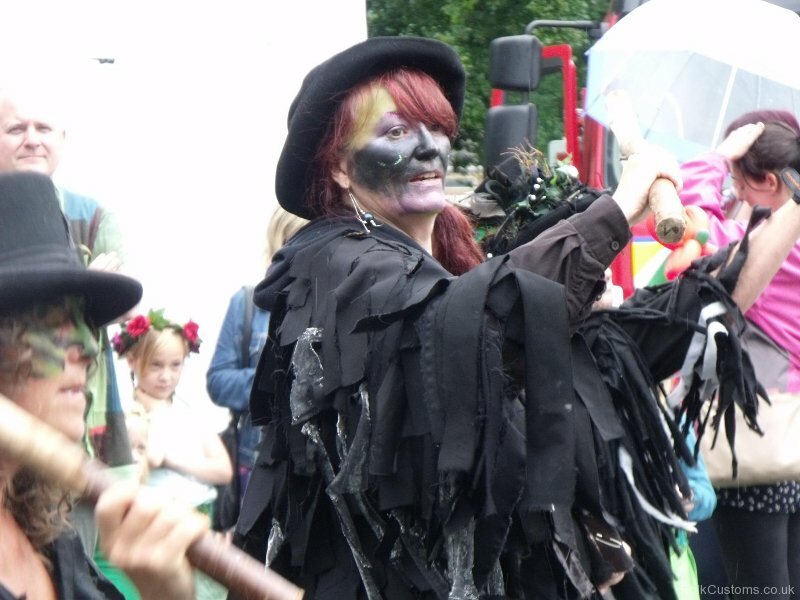 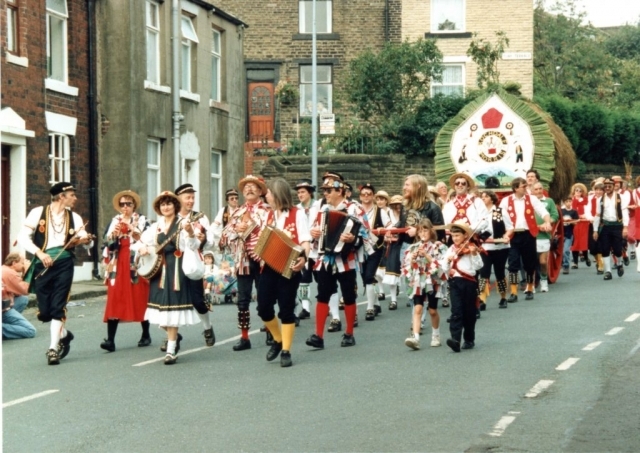 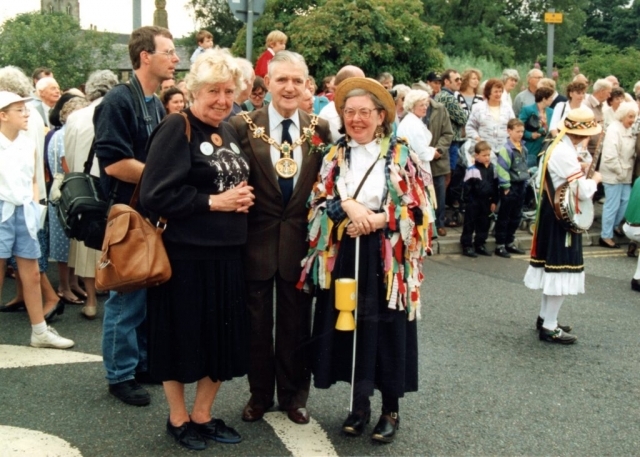 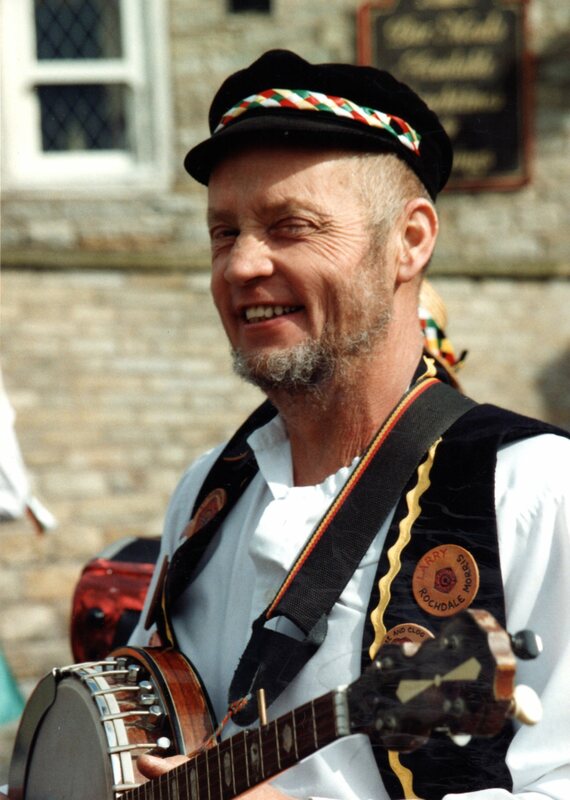 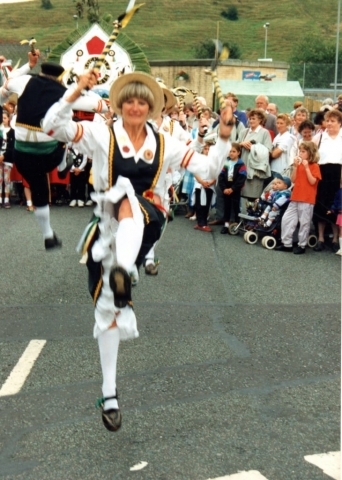 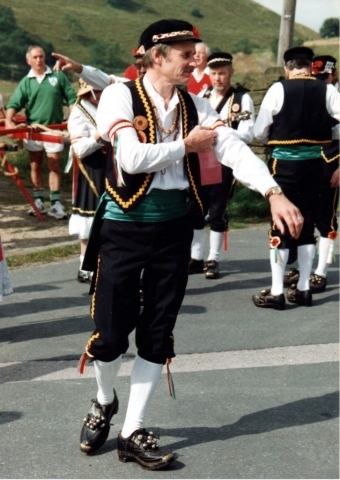 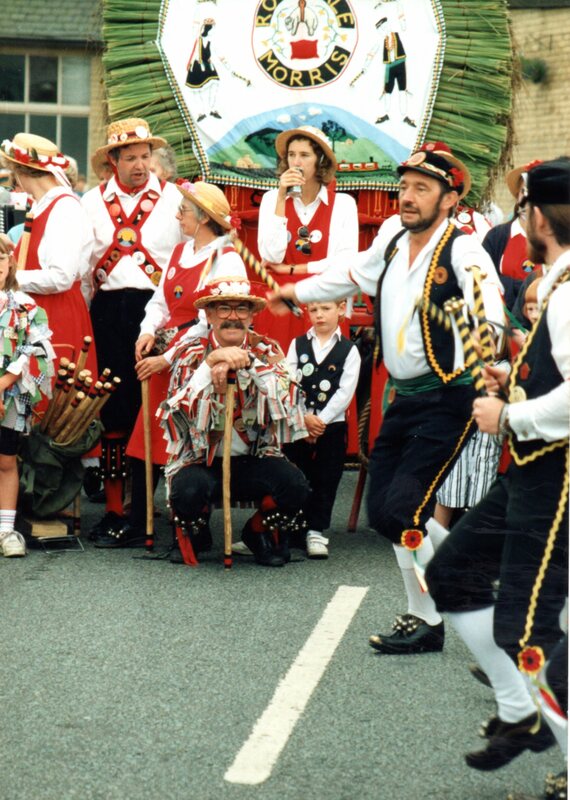 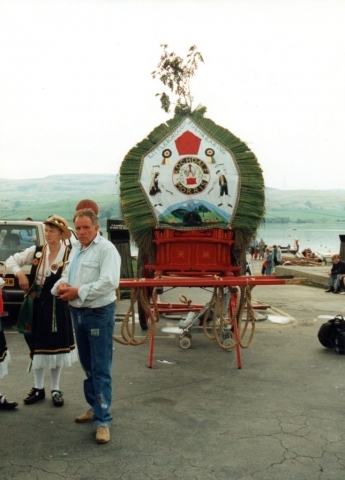 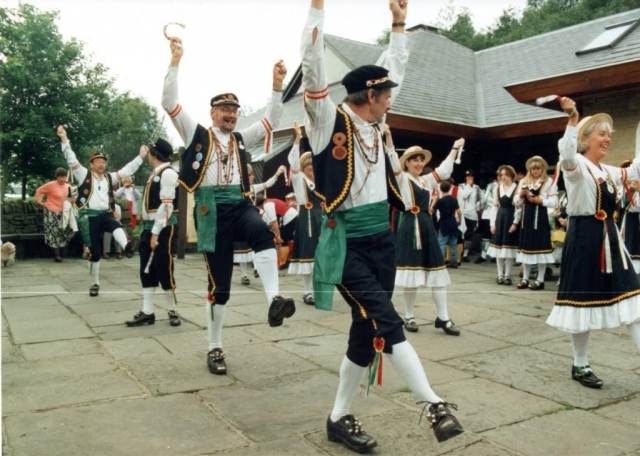 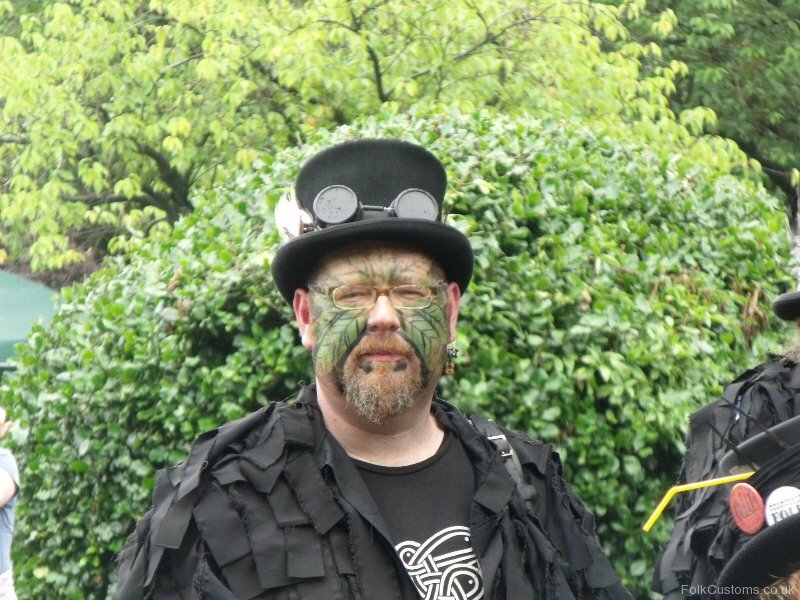 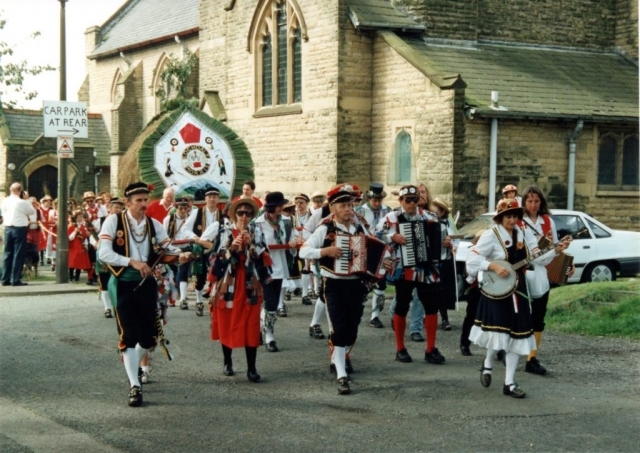 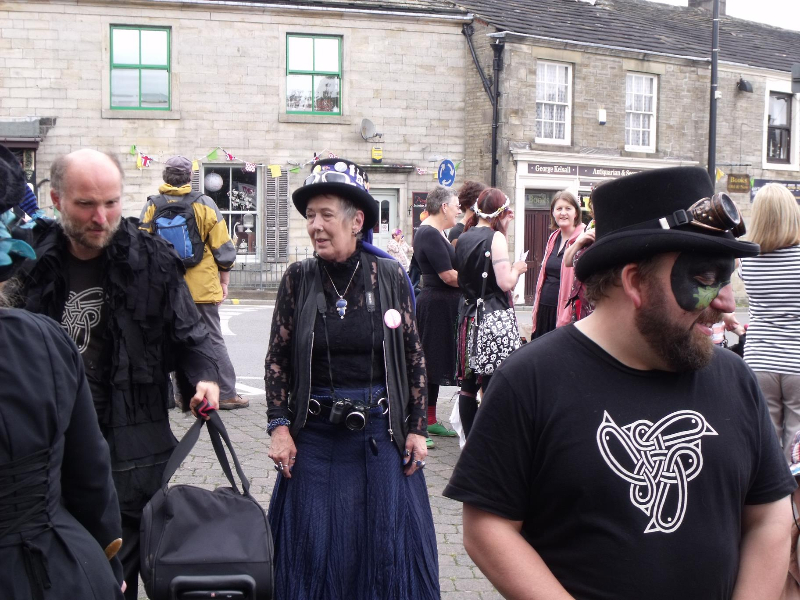 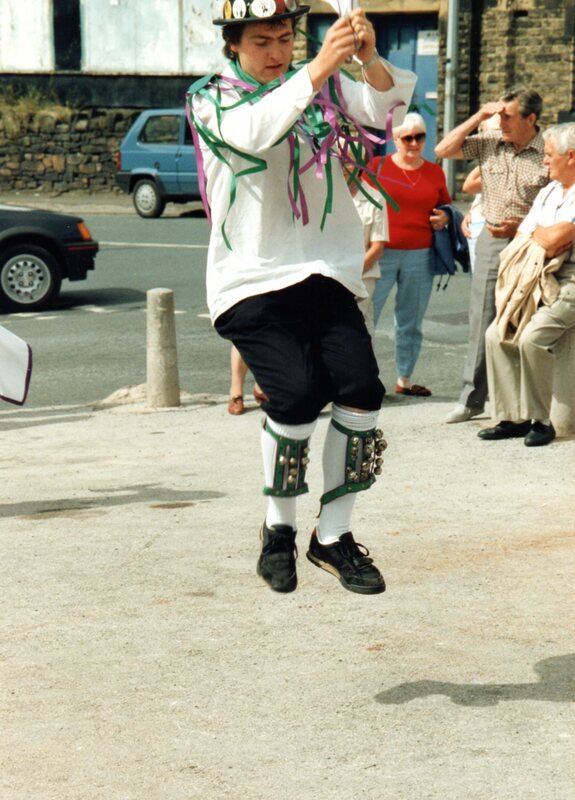 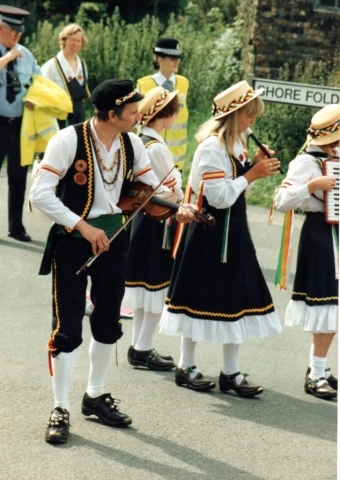 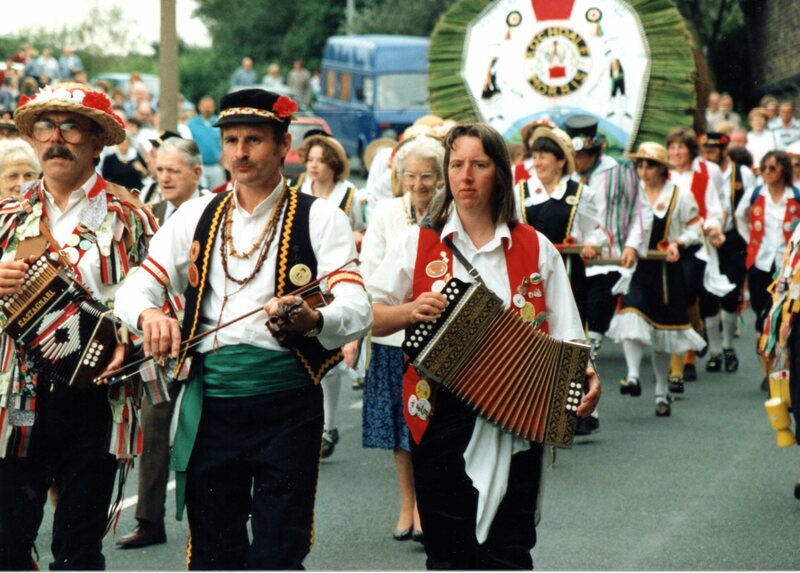 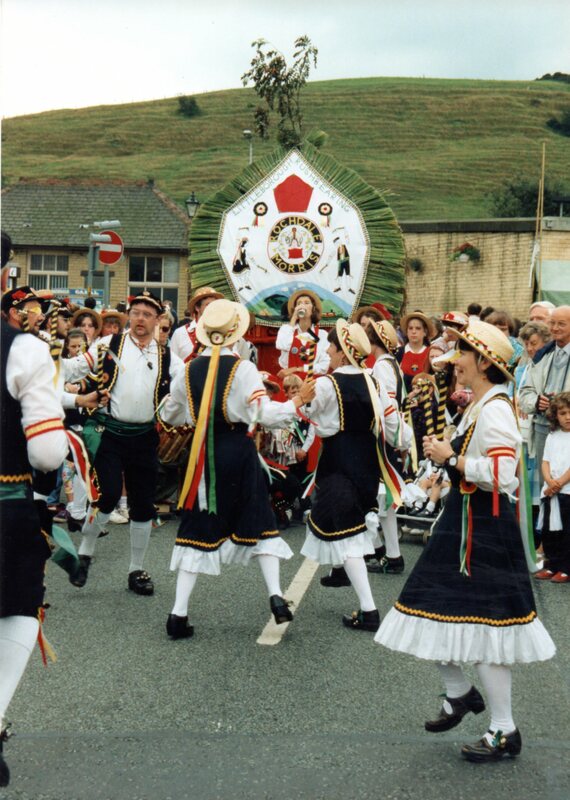 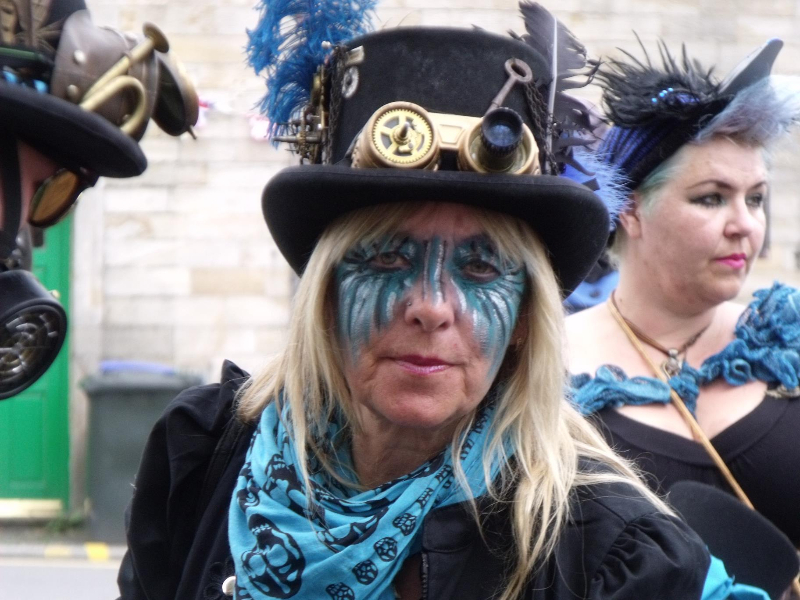 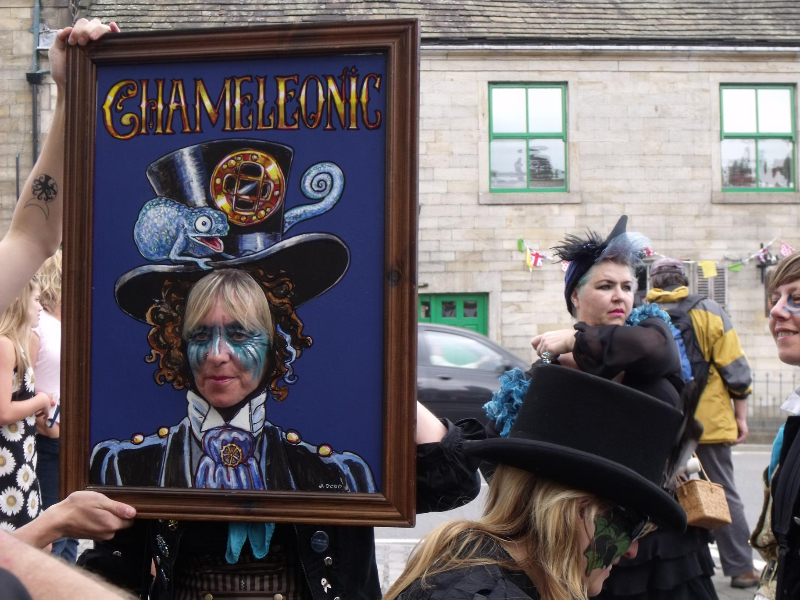 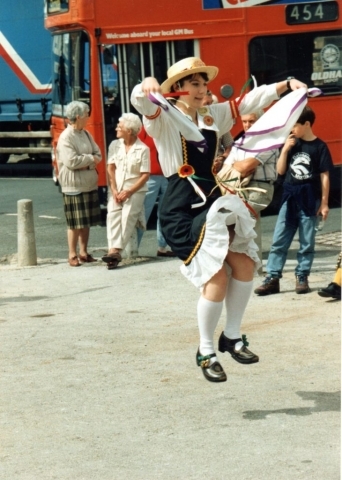 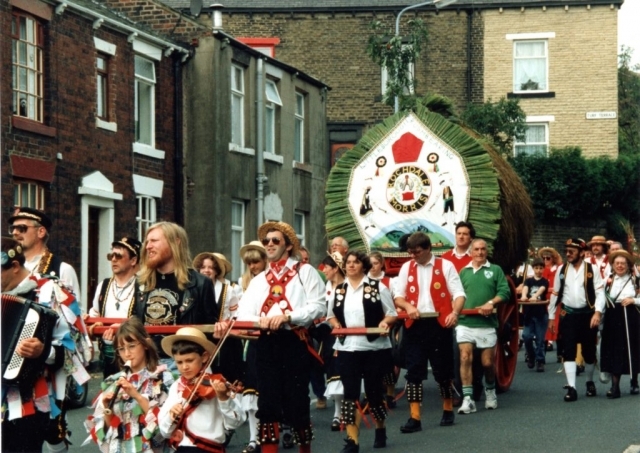 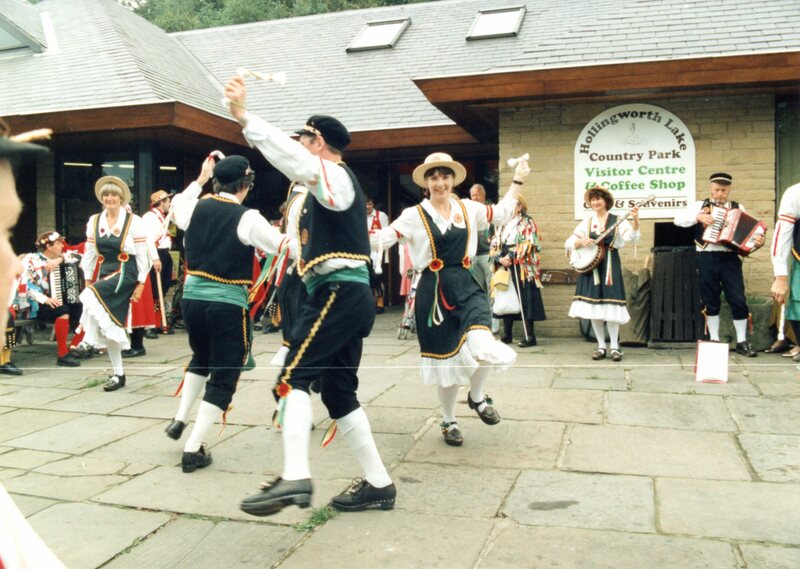 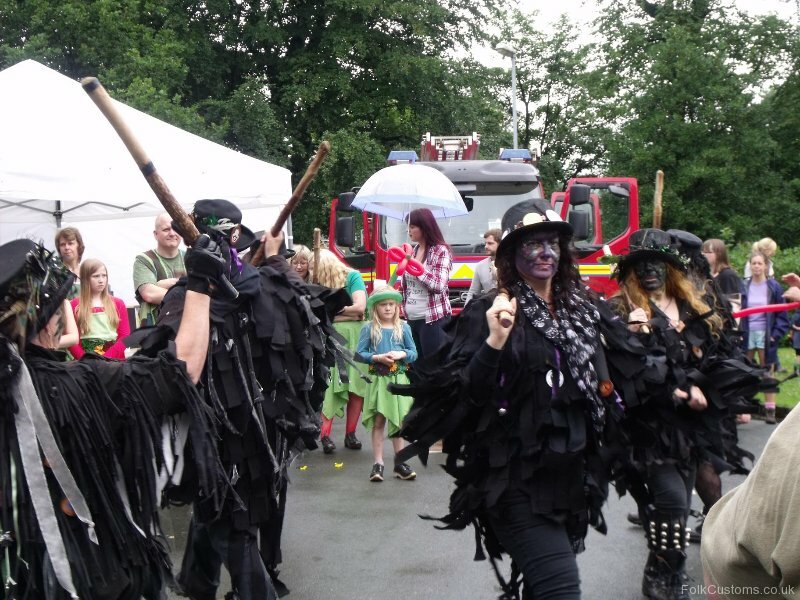 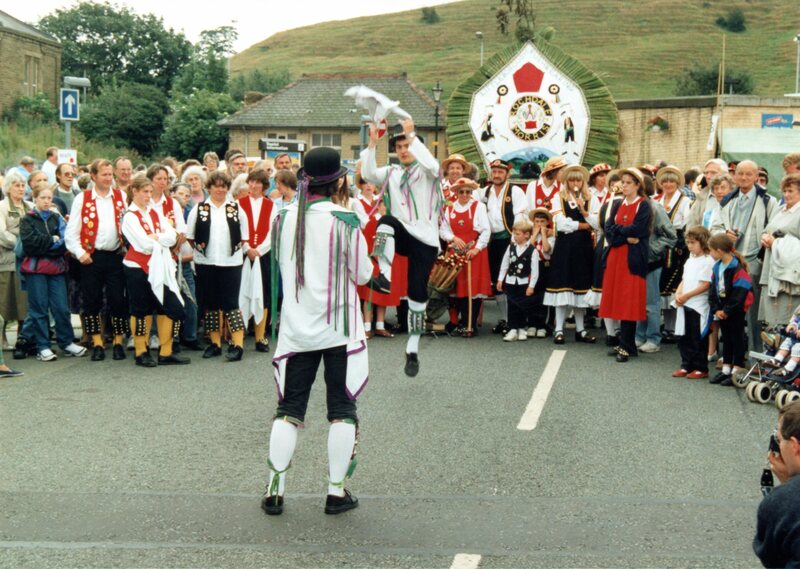 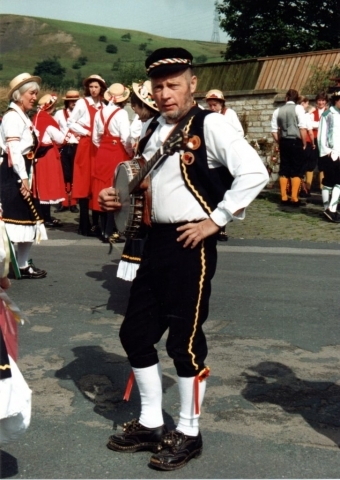 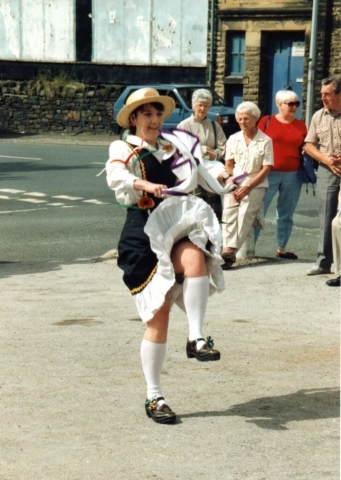 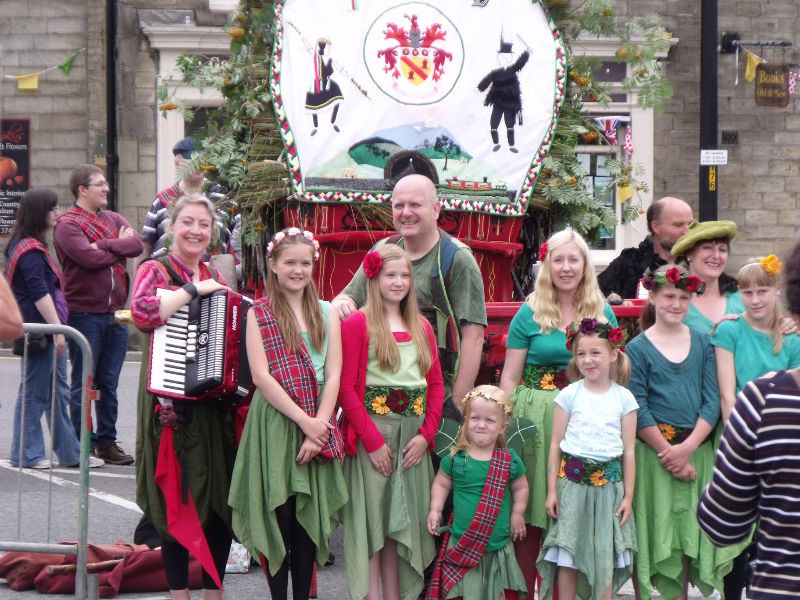 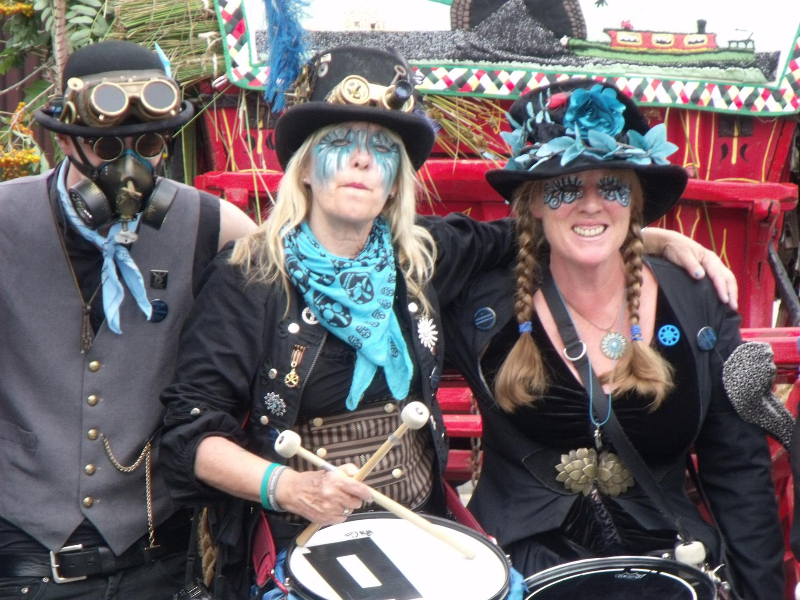 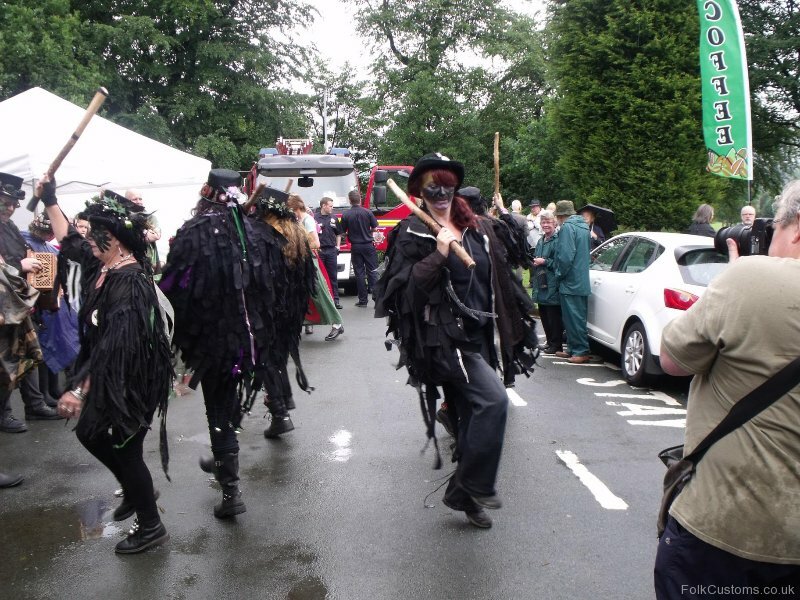 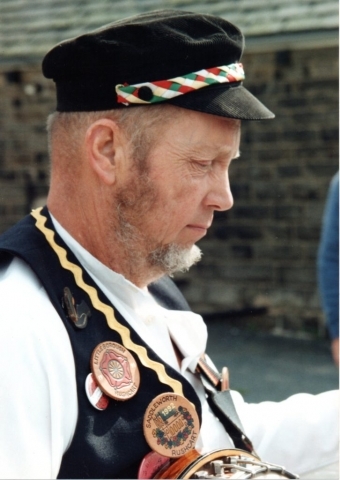 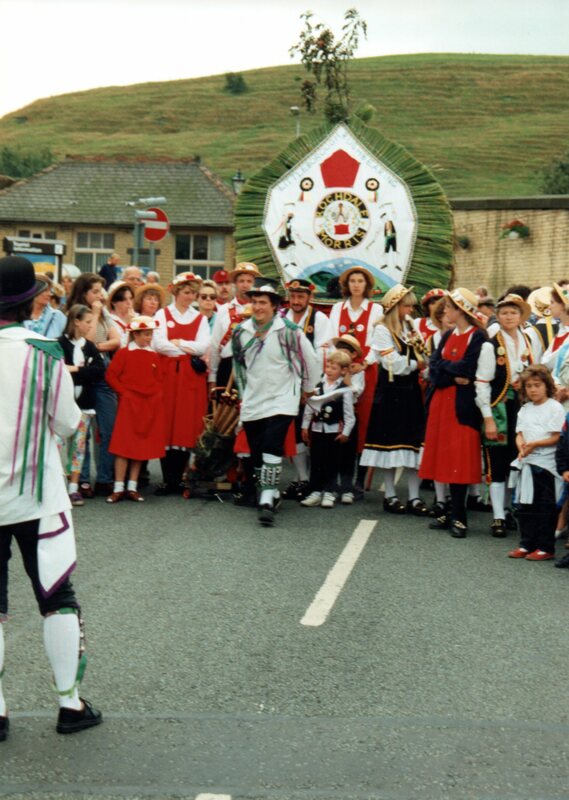 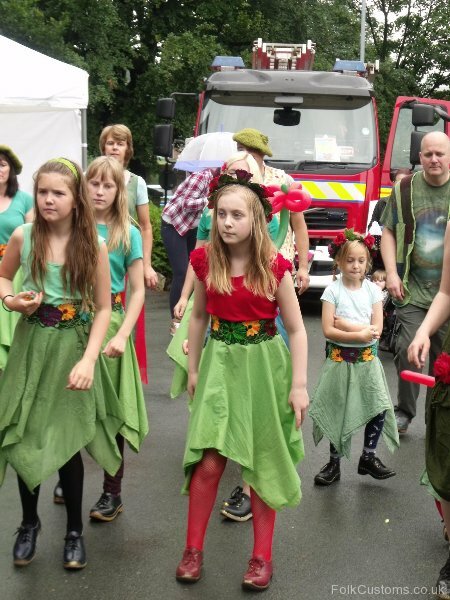 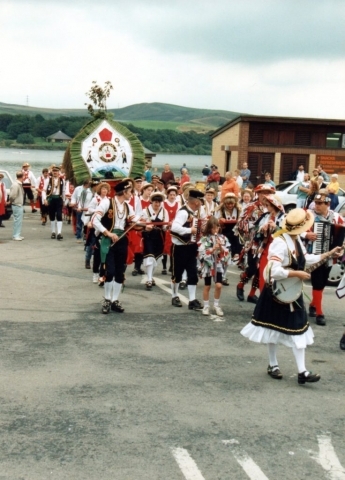 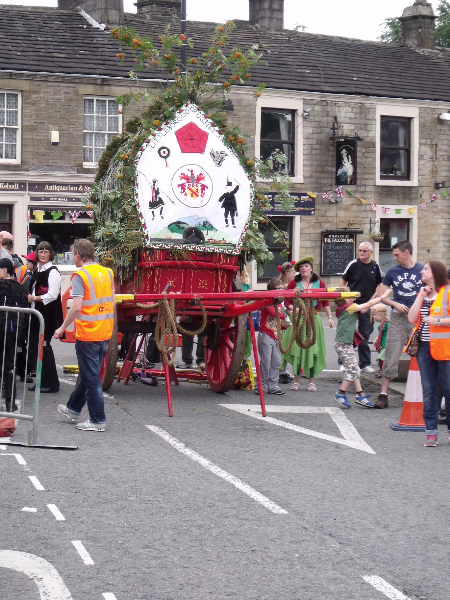 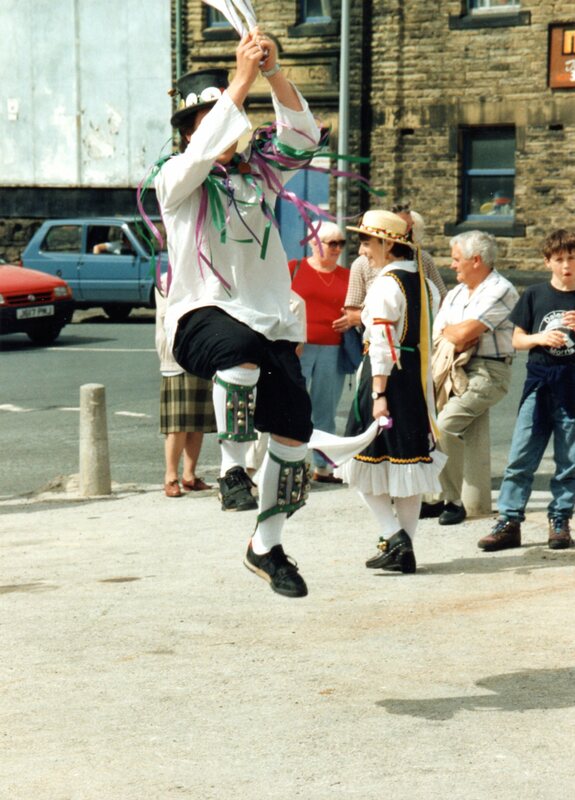 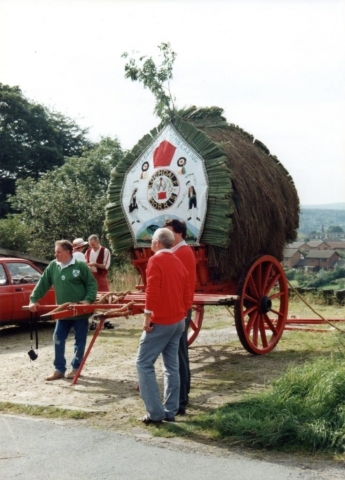 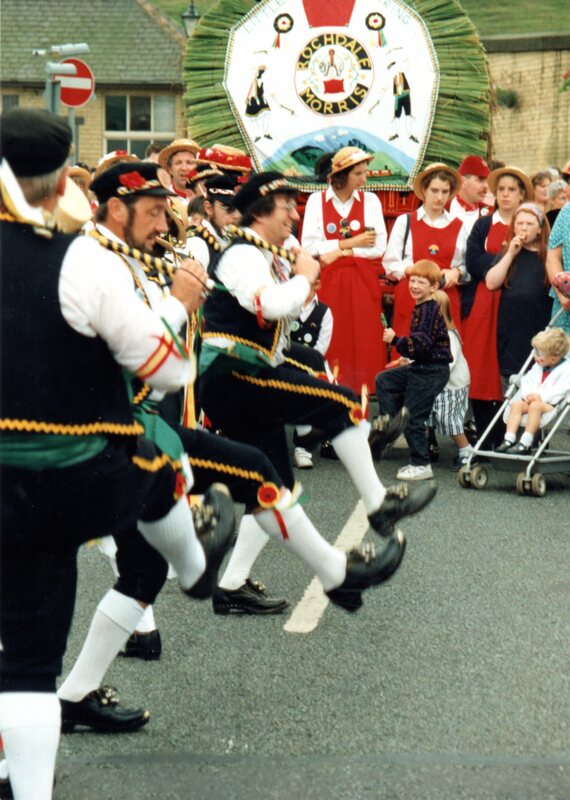 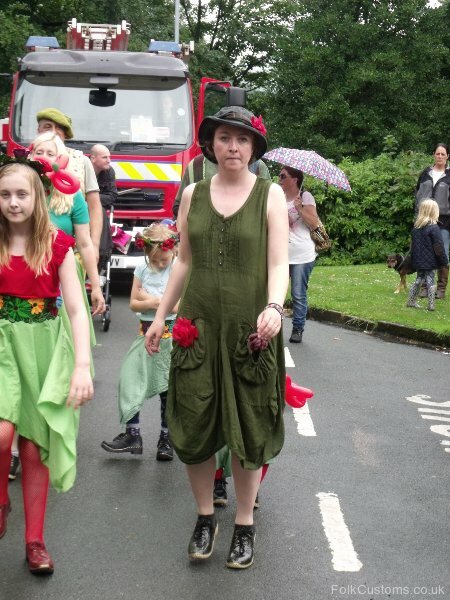 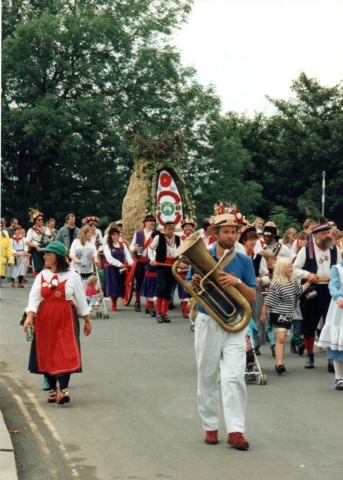 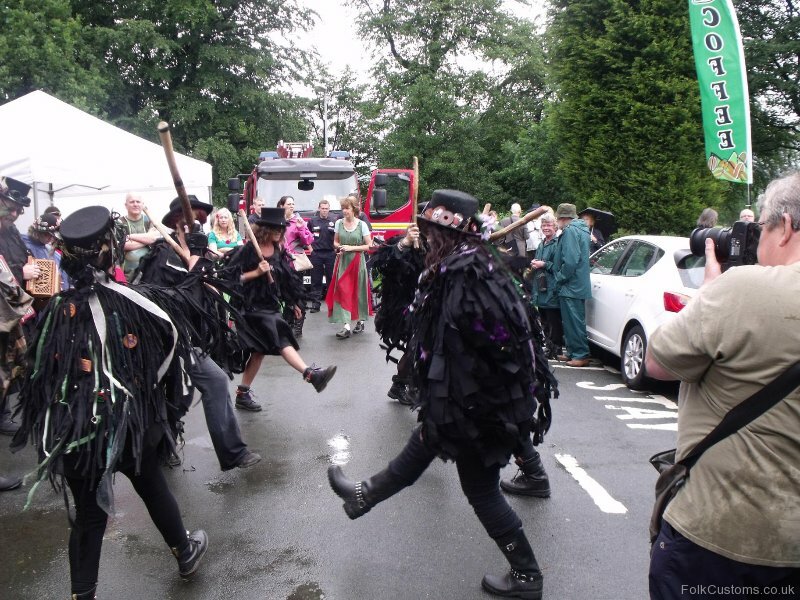 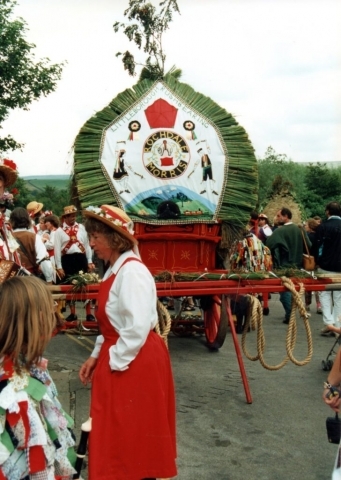 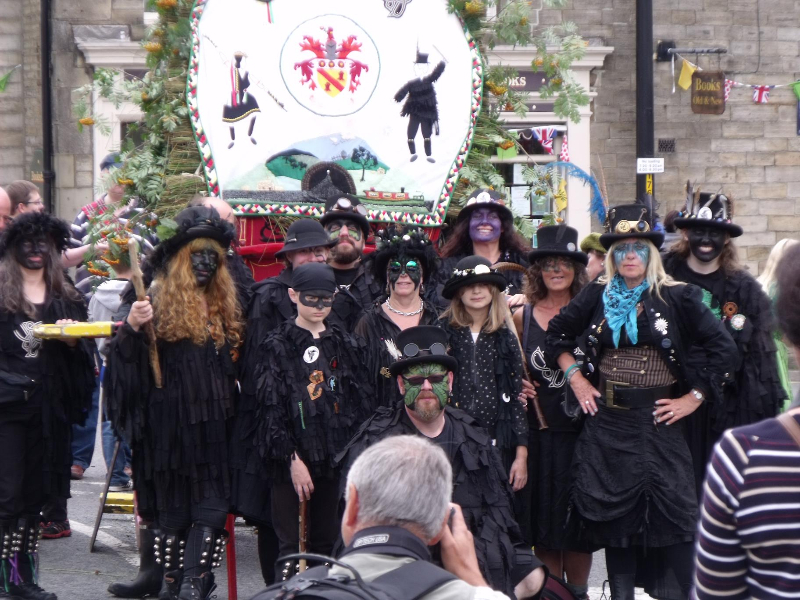 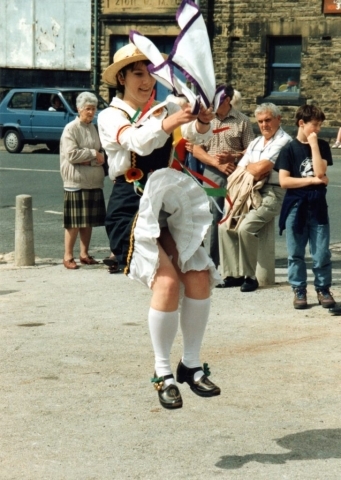 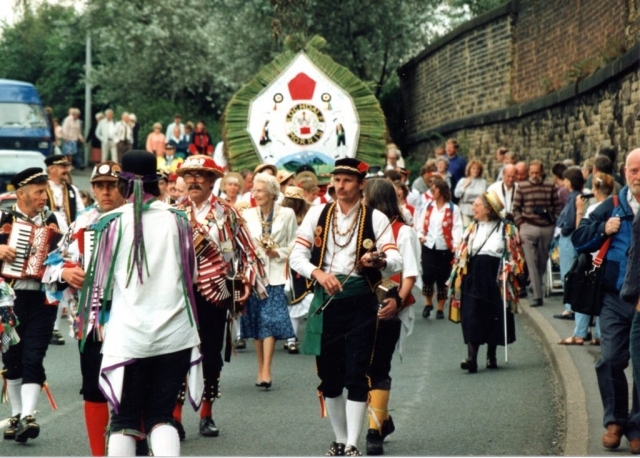 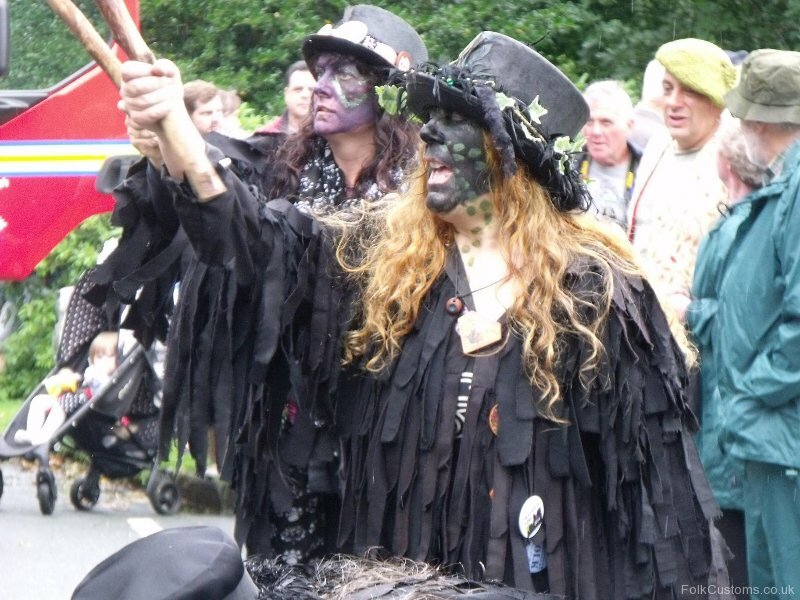 From the town of Bacup with blackened faces and unusual costumes comes a unique folk dance troup. 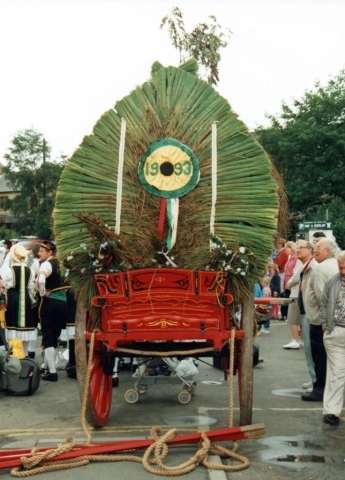 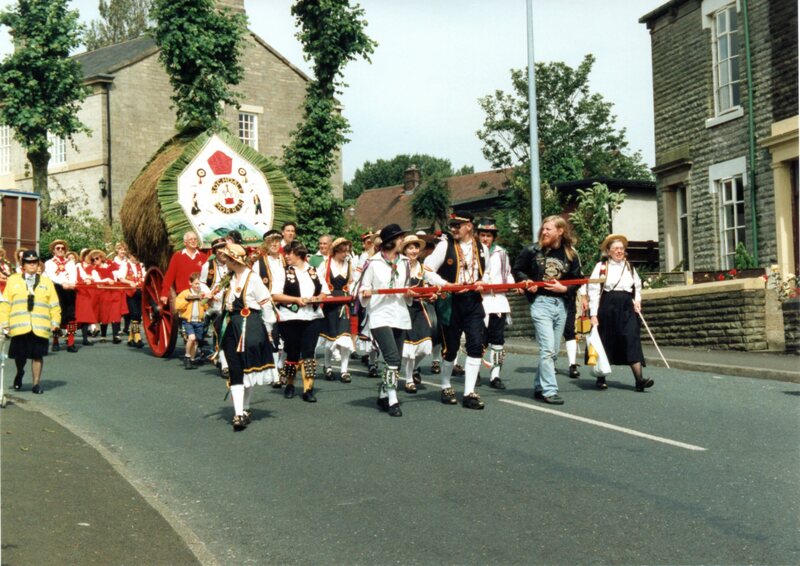 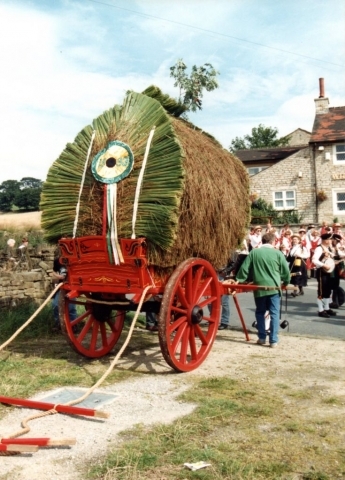 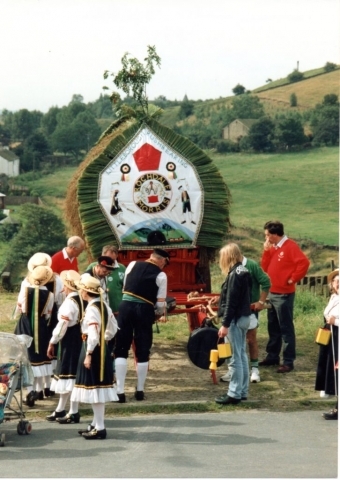 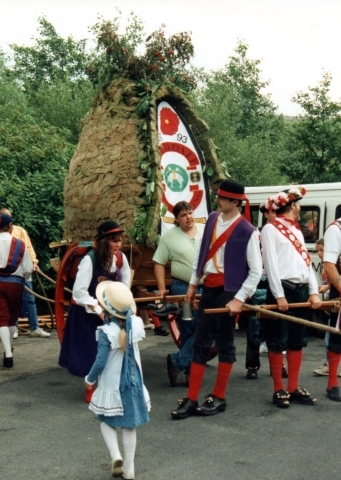 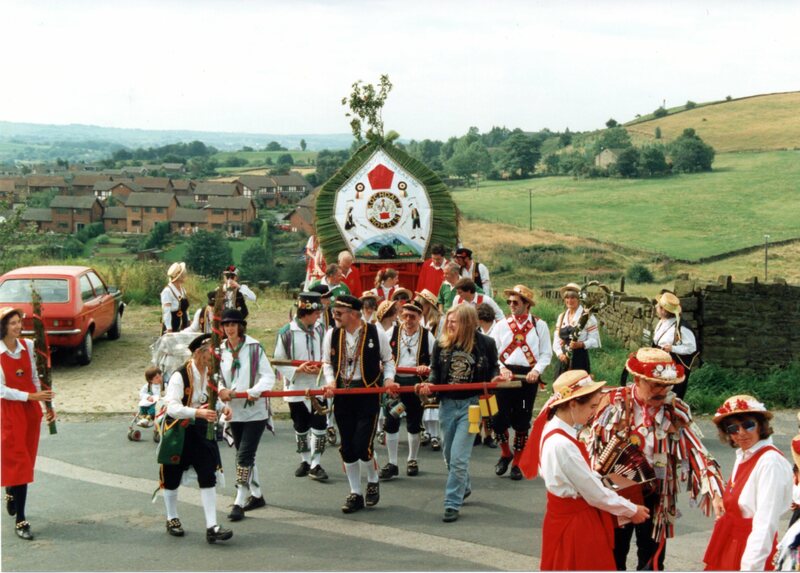 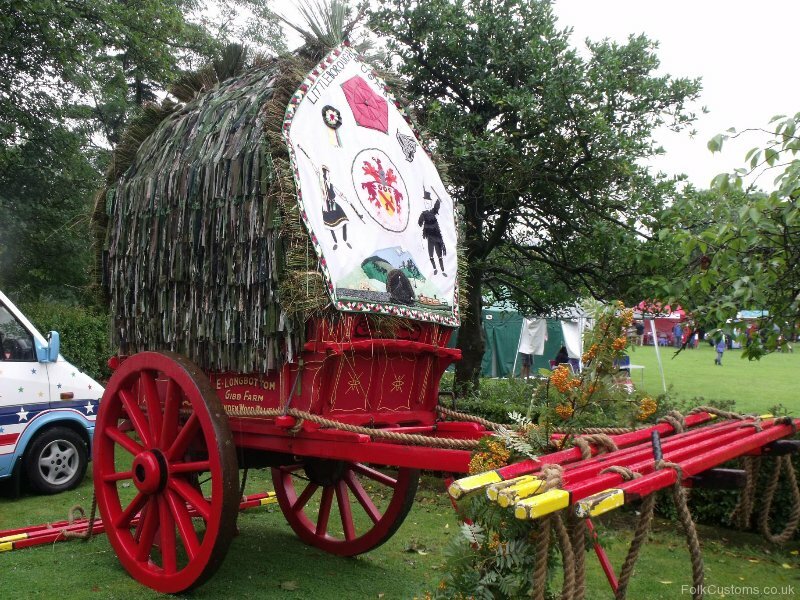 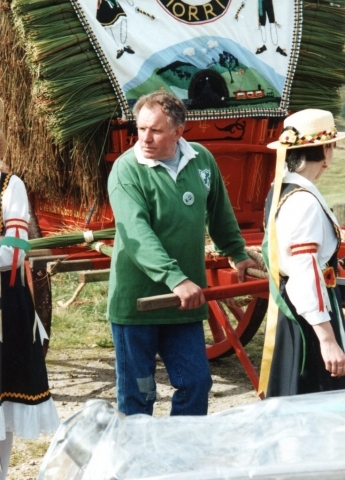 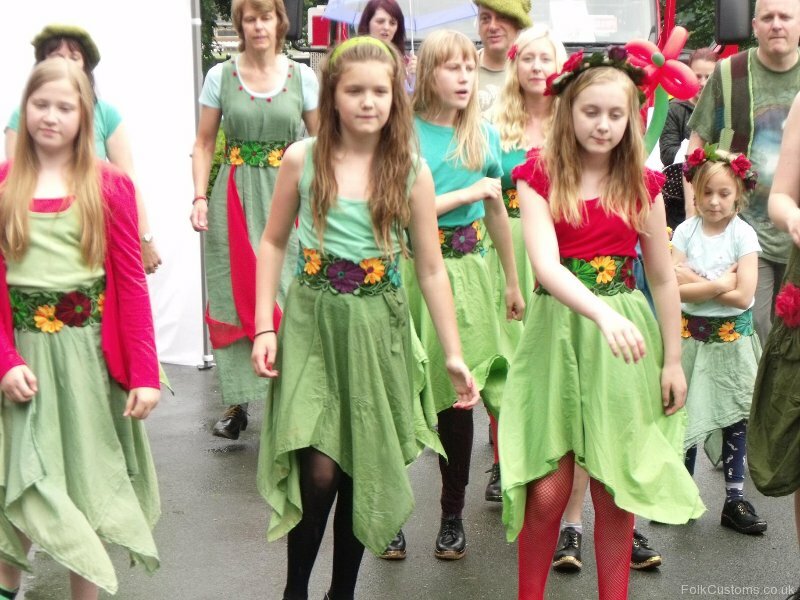 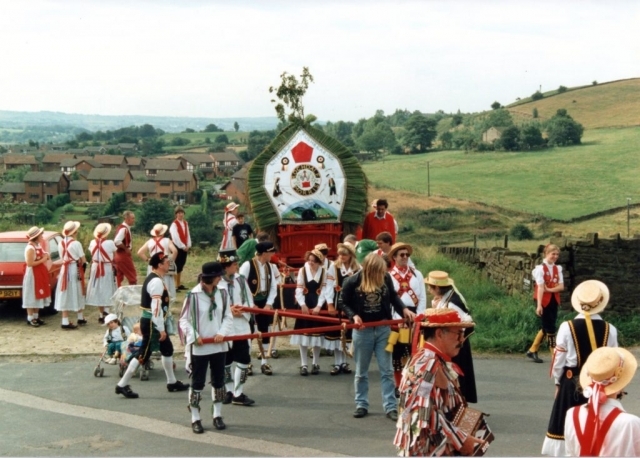 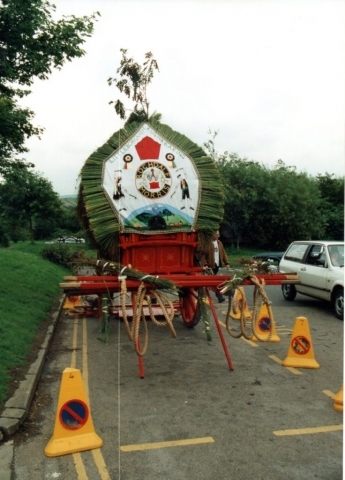 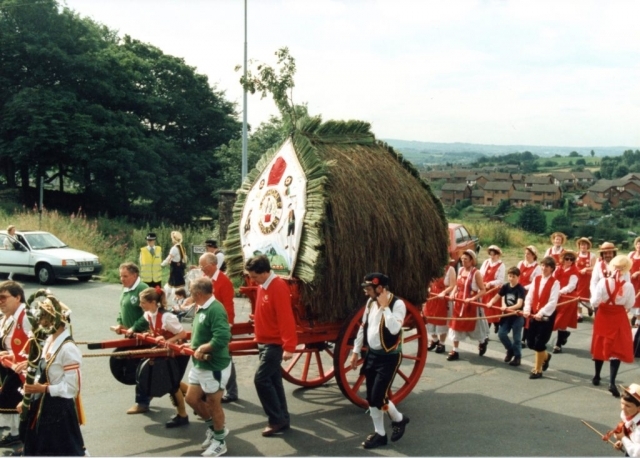 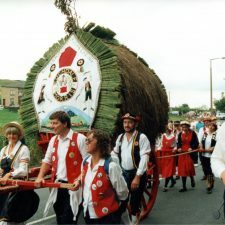 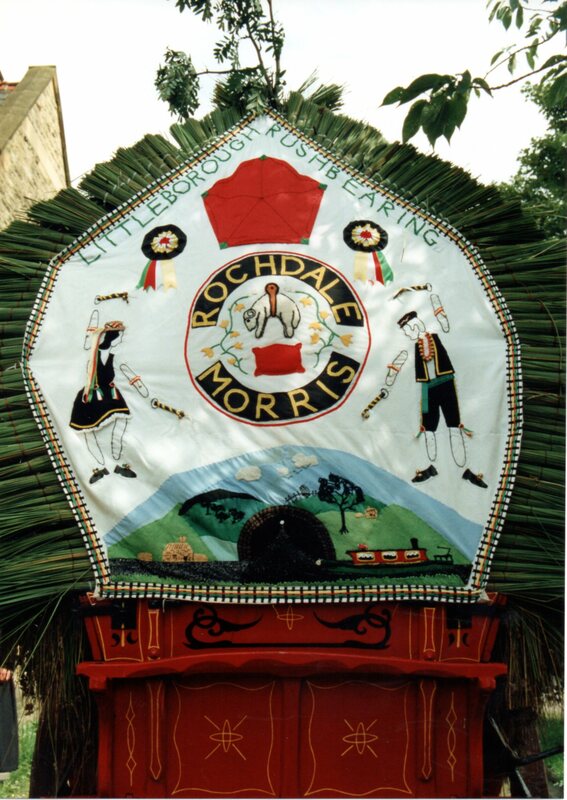 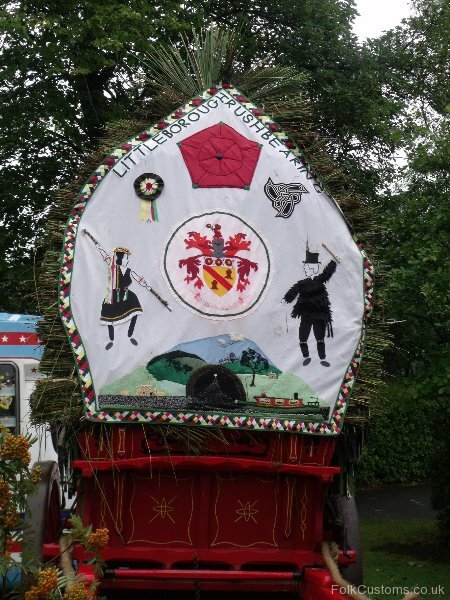 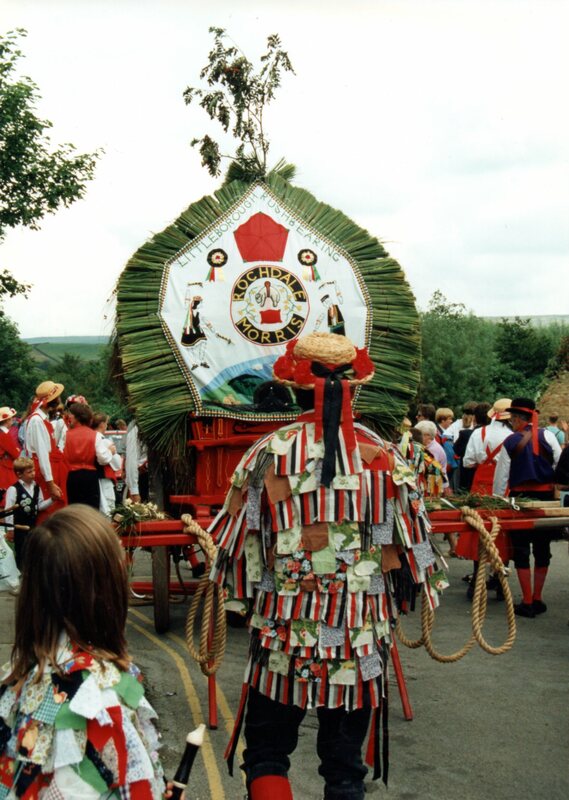 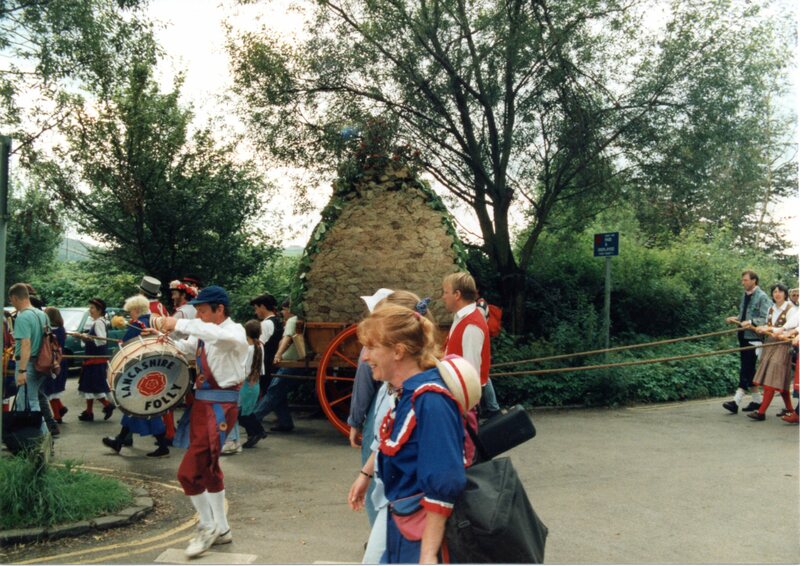 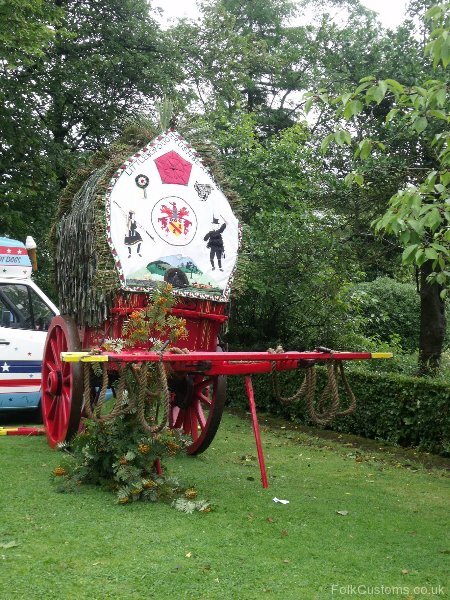 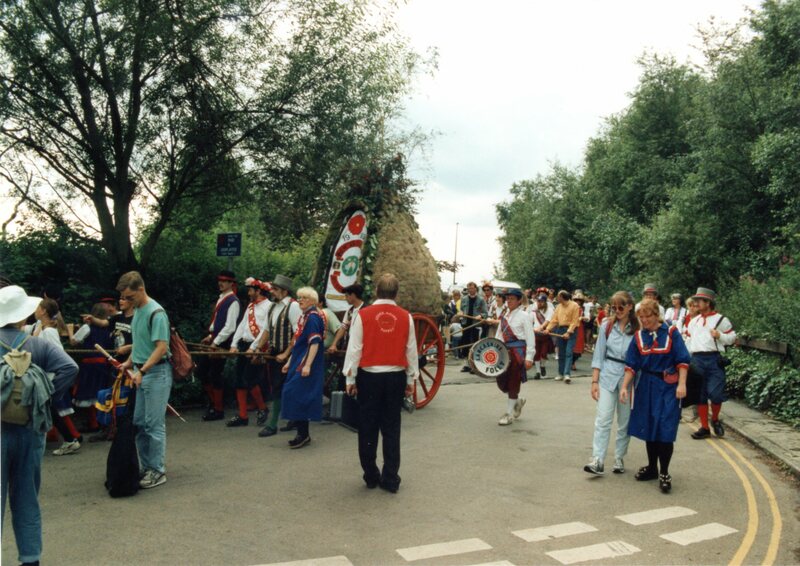 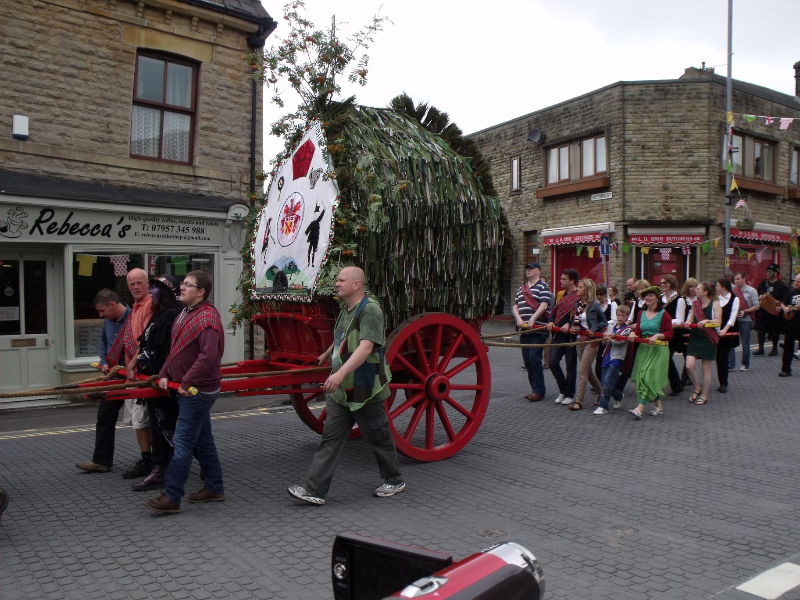 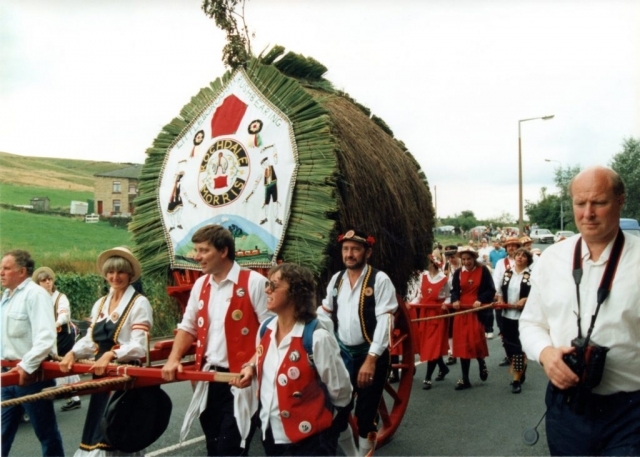 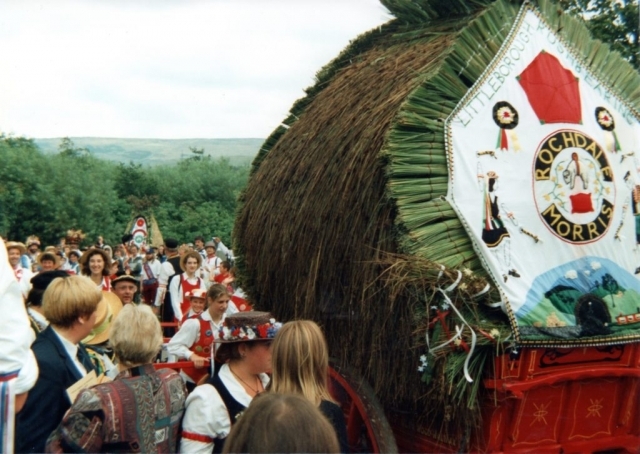 The team dances several garland dances once common as part of rushbearing festivals around the area, but also a “nut dance” of which they now seem to be the sole surviving example. 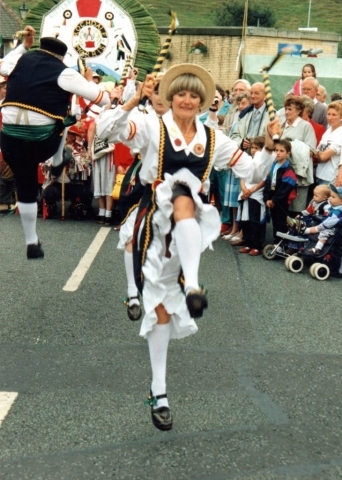 Whilst the clogs shirt and britches are traditional Lancashire, the white and red hooped skirt and white hat/turban seem more exotic in origin. 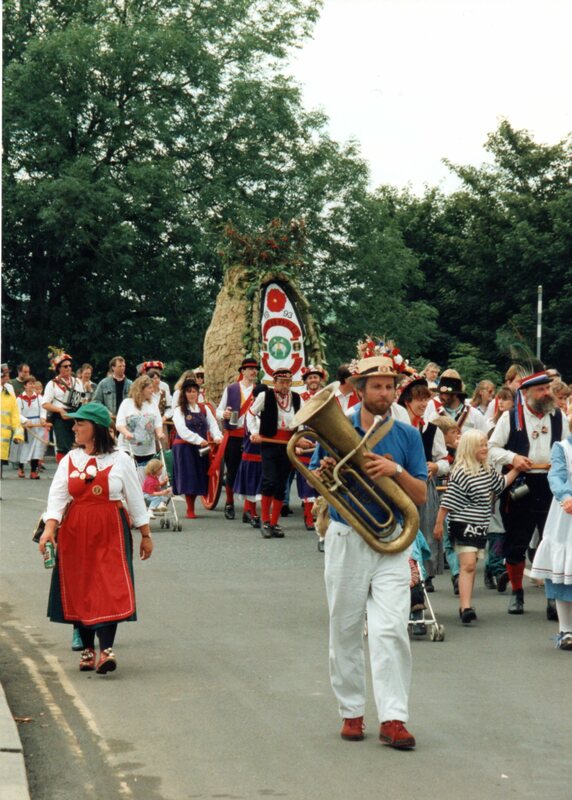 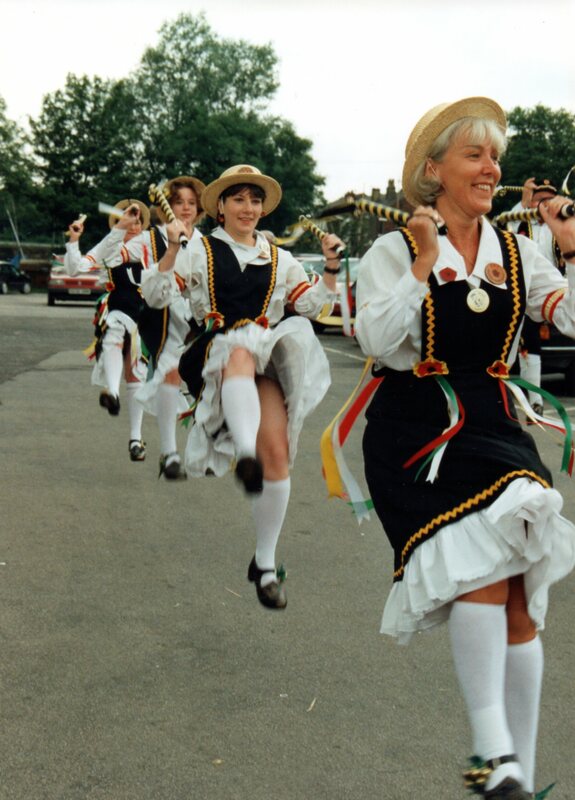 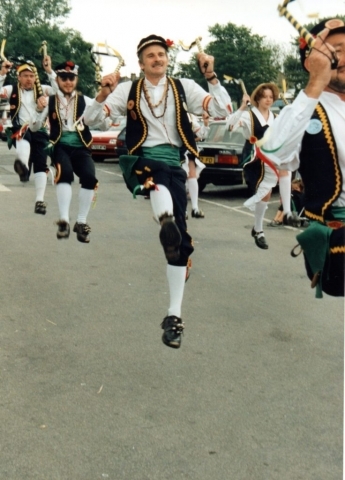 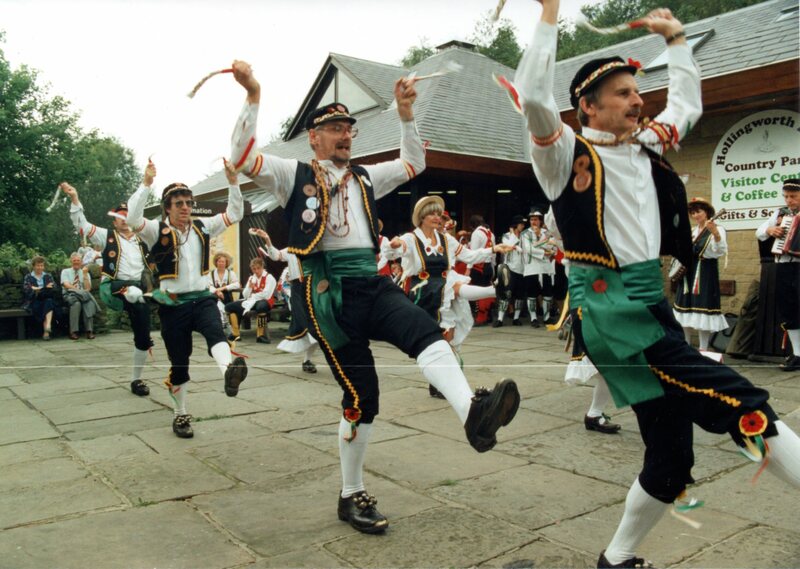 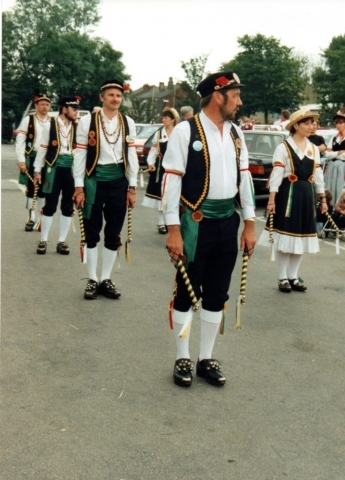 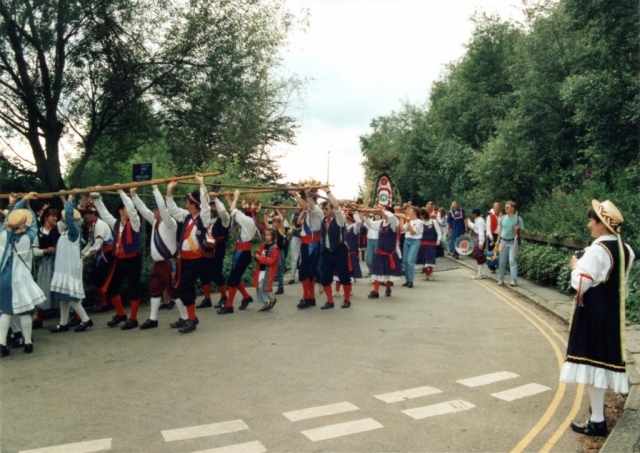 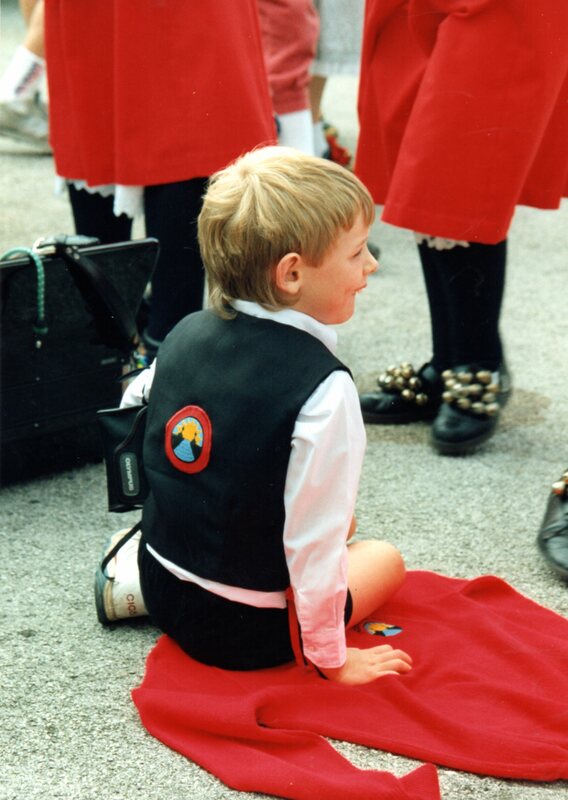 While Morris Dancing is rumoured to have been derived from the dances of the Moors, the African tribe that conquered large parts of Spain, Portugal and Southern France. 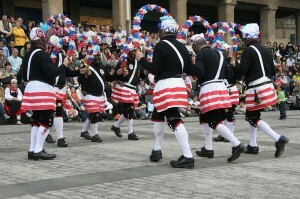 The tradition danced by the Britannia dancers seems to have a more definite link. 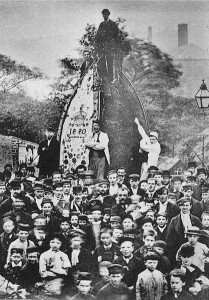 It is rumoured to have been taught to Cornish tin miners by Moors who came to this country and found employment in the mines. When the work in Cornwall became scarce during the 18th & 19th centuries some of the Cornish miners came to the North-West to work in the mines and quarries and brought the tradition with them. 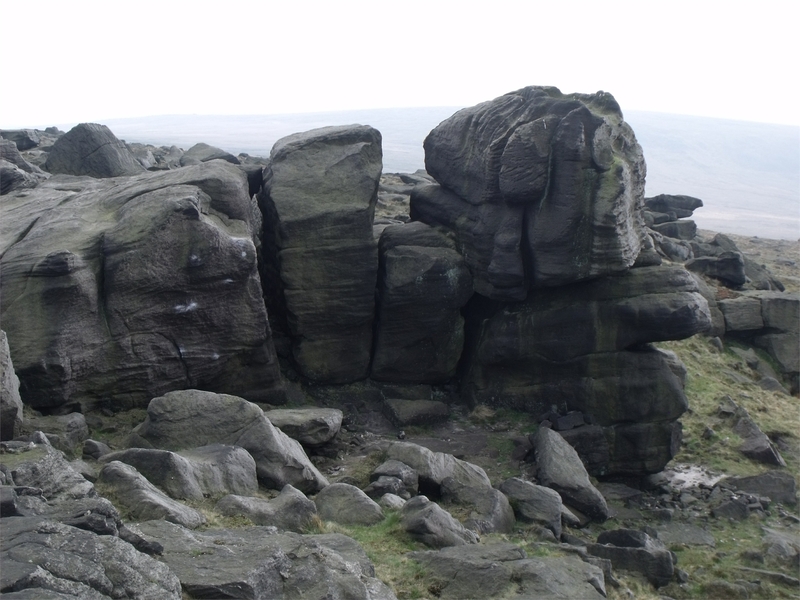 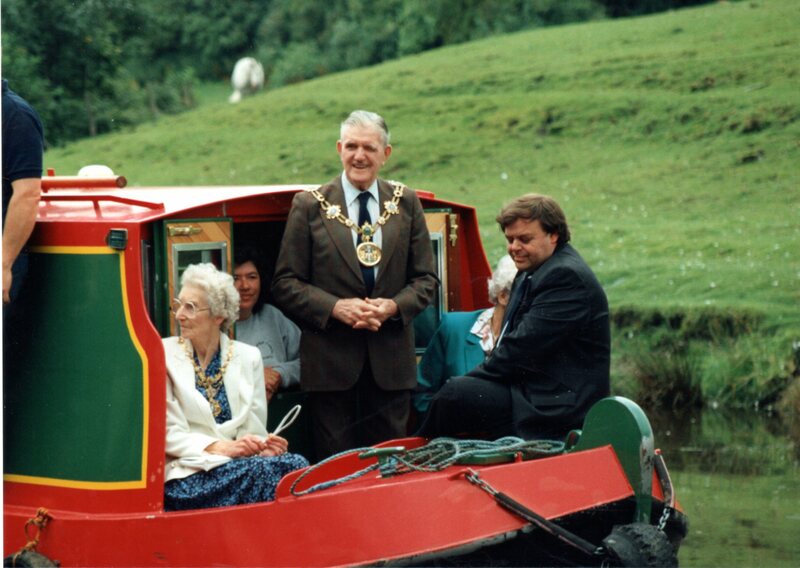 An’ rowlt away the stone. 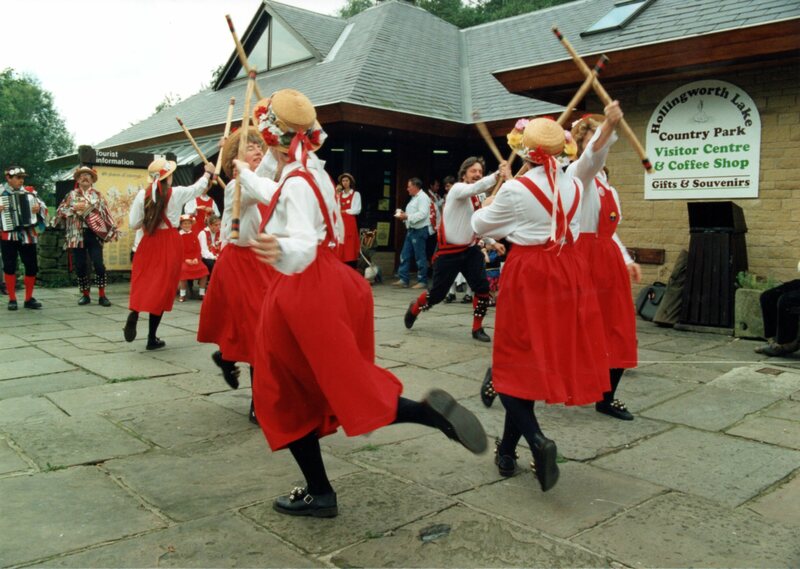 During the middle-ages it was common for the floors of buildings to be no more than compacted earth. To stop the floor getting muddy in wet weather and to insulate the rooms, rushes or hay were put down (sometimes mixed with herbs and flowers to freshen the air). 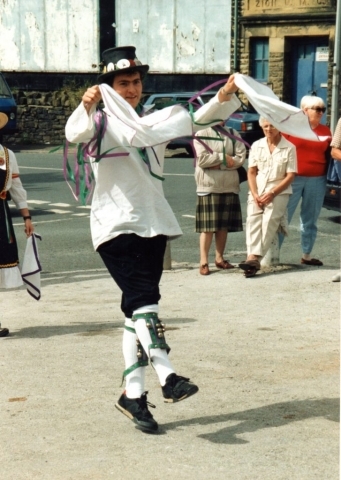 This floor-covering was known as thresh and a piece of wood or stone put across the bottom of a doorway to keep the thresh inside was known as a threshold. 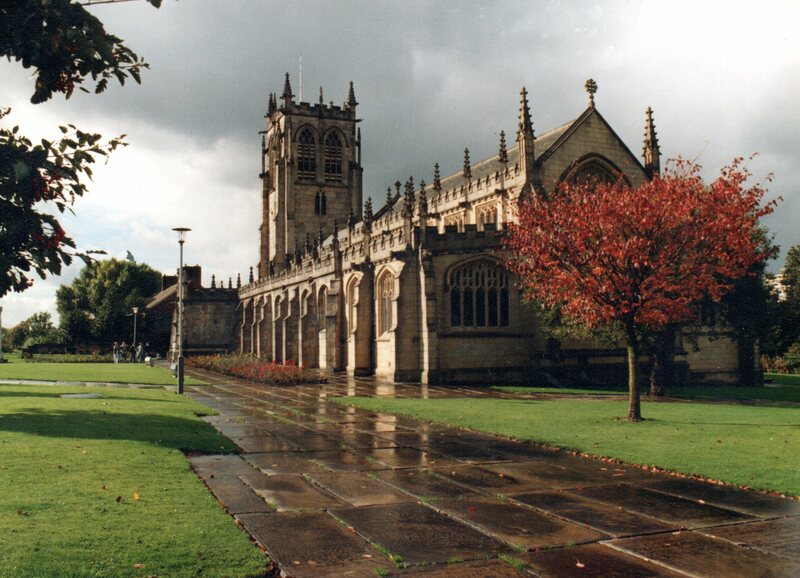 Seats were not provided in church until the 15th century and even if the floors were flagged the excessive cold after long standing and the kneeling required during devotions necessitated the floor being covered. 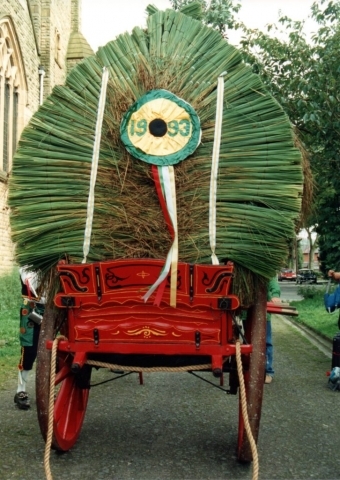 The renewal of the rushes at the church commonly coincided with the Saint’s Day to which the church was dedicated and the corresponding “Wake,” the custom quickly developed into a part of the religious festival.